That's why I decided to only book myself into hotels with exercise facilities. Unfortunately, budget hotels in Asia seldom have them … so I'll have to ignore my cheapskate gene and pay more than I'd like to. Here's the good news: Not only will I be able to stay in shape, but I'll also be investigating some great new investment ideas in the process. Why? The Asian Hotel Business Is Absolutely Booming! Last year, 124 million tourists visited China, making it the fourth most popular tourist destination in the world. What's more, the China National Tourism Administration (CNTA) expects the tourism industry to grow 10% a year for the next five years. And the World Tourism Organization predicts China will be the most popular destination in the world by 2020! Beijing alone was visited by 3.9 million tourists in 2006, a 7.5% increase over the previous year. But that number is going to explode even higher. Reason: Beijing is preparing to receive about 500,000 to 550,000 overseas visitors a day during the 2008 summer Olympics. However, with only 5,000 hotels, China has a woefully inadequate supply of rooms. To put that into perspective, the U.S. has about ten times as many hotels! This is why China now has more new hotels on the drawing board than anywhere else in the world. Given that backdrop of booming demand and short supply, you can see why the hotel business is an industry worthy of your attention. At a minimum, I believe that some of the best Asian hotel chains will see their stocks increase by 1,000% over the next decade. I'll get to those in a minute. First, let me tell you who is not going to profit from this Asian tourism boom – many of the popular western hotel chains like Marriott, Hilton, Hyatt, Starwood, and Wyndham. Marriott says it will add about six or seven Chinese hotels annually for the next few years. According to the company's CFO, Arne Sorenson, "It is not inconceivable we could have hundreds of hotels in China over a relatively short period of time." Of course, Marriott has more than 2,700 hotels around the world right now. 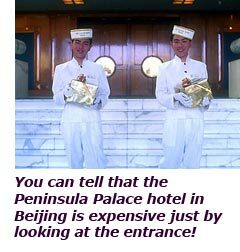 Even a couple hundred hotels in China wouldn't make that much of a difference to the company's bottom line! InterContinental Hotels Group (NYSE: IHG) is among the three largest hotel companies in China with 55 hotels and plans to have about 125 hotels by 2008. Shangri-La Asia (Hong Kong: 0069) plans to open nine new Chinese hotels in the next two years. Shangri-La is one of the most luxurious hotel chains in the world, and it's been making a killing. The average room rate in its Chinese hotels increased 12% just in the last year! Hong Kong & Shanghai Hotels (Hong Kong: 0045) owns the ultra-luxurious Peninsula hotels in Hong Kong, Manila, New York, Los Angeles, Beijing, Bangkok, and Chicago. Jinjiang International Hotels Group (Hong Kong: 2006) isn't well known to Americans, but it operates both luxury and economy hotels all over China. Orient-Express Hotels (NYSE:OEH) owns or has stakes in about 40 top-end hotels worldwide, including the famous Orient-Express train line. Harbour Centre Development Ltd. (Hong Kong: 0051) is mainly engaged in hotel and property-related operations, including the trio of Marco Polo hotels in Hong Kong. Mandarin Oriental Hotel Group (Singapore: MOIL) owns or manages 30 upscale hotels in more than a dozen countries, including its flagship Mandarin Oriental in Hong Kong and The Oriental in Bangkok. 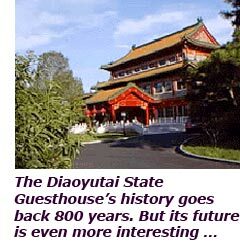 The Diaoyutai State Guesthouse was formerly a vacation home for Chinese emperors, and can trace its origin back 800 years to the Jin Dynasty. This collection of 18 buildings sits on a meticulously landscaped compound of more than 124 acres in the heart of Beijing. It is generally reserved for foreign heads of state and leaders of China. Soon, however, the Diaoyutai might become more of a household name. Reason: MGM recently signed a joint-venture deal with Diaoyutai to develop luxury hotels and resorts around the world. The combination of the Diaoyutai brand's cachet and MGM's wildly profitable casino properties could make MGM the biggest home run of them all! Now, I'm not suggesting that you rush out and invest in any of these companies just yet. I'm reserving my final judgment until I've kicked the tires, visited with management, and evaluated the underlying real estate each of these hotel chains owns. Remember, hotel companies can have both profitable businesses and great real estate assets. When you're talking about some of the fastest-growing cities in the world, the value of that underlying real estate can be increasing faster than the speed of light. As you might guess, I'll also be "inspecting" as many hotel exercise facilities as I can, too. That'll be a great way to stick to my new fitness commitment and help me figure out first-hand which hotel stocks to recommend. Stay tuned! P.S. If you want someone to help you find the best Asian investments, consider subscribing to my Asia Stock Alert service.